Restless Nights, Goodbye Heart’s five track EP, is a synth-pop dream. 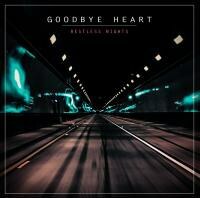 Restless Nights is a five-track EP by duo Goodbye Heart, made up of cool and shimmering electro. Minimalist and bordering on miserable, it’s modern, weird, strangely uplifting, with delightfully dramatic moments of gloom and modern terror; all the contradictions we experience. “Just Kids” is fearsome in its loneliness, like the cold sweep of bright halogen headlights at night. The two techie kids of Goodbye Heart are originally from New York but have relatively recently relocated to Seattle, so it seems more than possible that the title is a reference to their hometown via Patti Smith’s New York novella of the same name. In any event “Just Kids” is programmed and sung exquisitely. The hypnotic sedative of “Seconal” (side-effects include a slow heartbeat and easy bruising) delicately blends Sam Ford and Nila K. Leigh’s fragile vocals. Containing one hundred milligrams of ambient, floating sadness, “Seconal” can be broken down to a white odourless sound, soluble in water or alcohol. “Wish” is the resultant neon dream after grey daytime life; textured musical waves flood the listener repeatedly, submerging us in aqueous travel with devils and heroes. “How to Make Friends in a New Town” is, as you would imagine, difficult; the modernist synths are gently traumatic, reflecting the struggle in submitting to a new location. “Don’t Slow Down” is by no means fast; instead it’s spaced-out and airy, at times over-powering. Yes, these are ethereal songs that we don’t have to fully understand to enjoy. Intensely glacial but somehow also warm-natured, Goodbye Heart could be from the future. Inspiring.